Graduation is just around the corner. This a a huge milestone and deserves some celebration. Custom graduation gifts are a great way to honor the graduates in your life. There are all kinds of items available as gifts, decor and much more. Whether your the parent, family or friend or part of the school faculty, we've got what you're looking for! Custom graduation banners are a must have for everyone! Highlight the students accomplishments and put them on display. Graduation banners are great in your yard, the neighborhood entrance, at the graduation ceremony, in front of the school or for use at your after party. You can then give it to the student, to treasure for years to come. These are completely customizable with full color photo printing. Not sure how you want it to look? You can just ask us to help with a design. 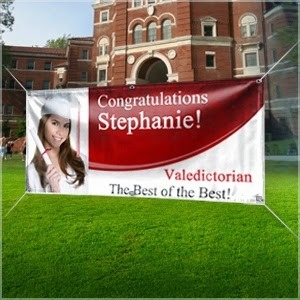 Custom banners can be used for any graduation, including college and for any event!